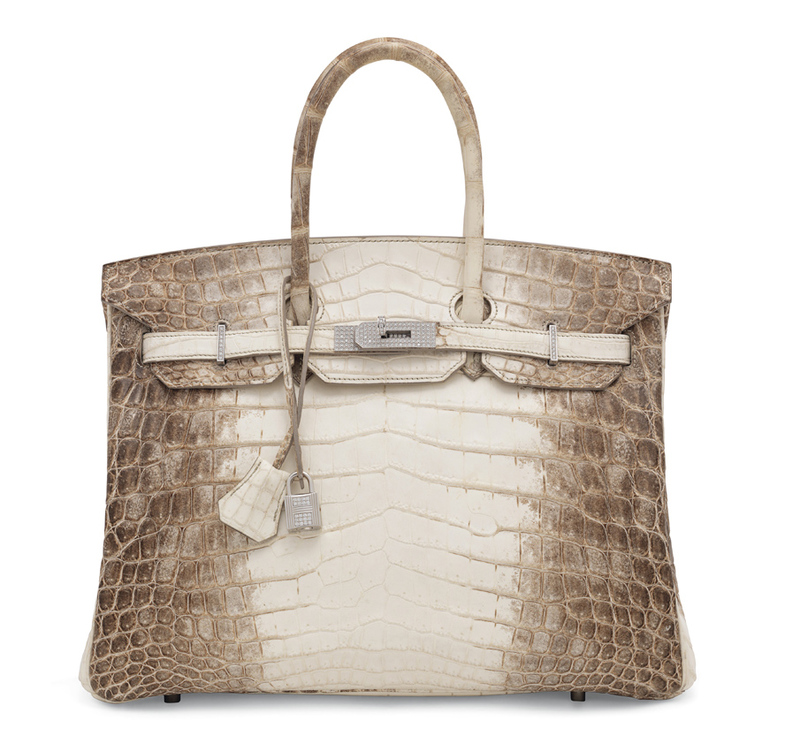 A 2010 Hermès Himalaya crocodile Birkin 35 with white gold and diamond hardware, which sold for £190,000 at Christie’s. Made from Nile crocodile hide – typically complemented by white gold or palladium hardware – this deluxe version of the Birkin takes its name from the delicate gradation of the colour achieved by a painstaking dying process. The smoky grey hue fading into a pearly white is thought to resemble the snow-capped peaks of the Himalayas. The bag has a reported private sale record of $432,000. Many of the most expensive handbags sold at auction are variants of the Himalaya Birkin or the Himalaya Kelly. In 2016, at Christie’s 30th anniversary Hong Kong auction, a 2008 Himalaya Birkin 30 with 18 carat white gold and diamond studded hardware for a premium-inclusive £232,000 – a record broken the following year when, again at Christie’s Hong Kong, a 2014 Himalaya Birkin 30 realised £293,000. On December 12, Christie’s winter season in London concluded with the biannual Handbags & Accessories auction which totalled just shy of £3m and achieved a lively sell-through rates of 93% by lot. Again the top lot of the sale was a Hermès Himalaya Birkin – this example made in 2010 to the slightly larger 35cm wide specification. At the hammer price of £190,000 (estimate £100,000-150,000), it established a new European record for a handbag sold at auction – bettering the £130,000 bid for another Himalaya Birkin 30 the auctioneers had sold in the equivalent sale in June. Custom-made or limited edition Hermès bags, many of them 2017 and 2018 models, were avidly pursued throughout the sale. A 2017 Quelle Idole – a rare iteration crafted of matte alligator skin with leather accents – sold at £55,000 (estimate £35,000-40,000). Also known as the Kelly Doll on account of its cutesy face, arms and feet, this bag, designed in collaboration with then Hermès chairman Jean-Louis Dumas, was first issued as a millennium project in 2000. Since its reissue, the bag has become one of Hermès most sought-after limited edition pieces.